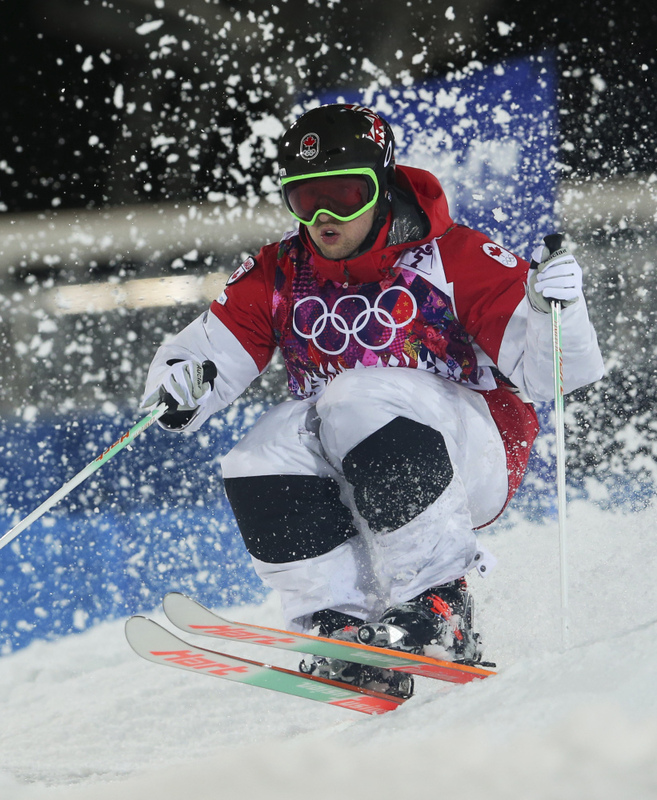 The 26-year-old Canadian fended off rival Mikael Kingsbury with a perfect run in the finals to clinch gold. KRASNAYA POLYANA, Russia (AP) — Canada’s Alex Bilodeau defended his gold medal in Olympic men’s moguls on Monday night, fending off rival Mikael Kingsbury to become the first freestyle skier to win consecutive Olympic titles. Bilodeau put together a perfect run in the finals to make history, posting a score of 26.31 on the slushy Rosa Khutor Extreme Park course in the medal round. In the giddy aftermath, he reached over a retaining fence and grabbed his older brother Frederic to celebrate. Bilodeau has called his brother, who has cerebral palsy, an inspiration throughout his career. Kingsbury endured a slight form break in the middle of his run and ended up with silver. Alexandr Smyshlyaev of Russia took bronze. Considering the stranglehold Canada has on the sport at the moment, bronze is as good as gold for everybody else. Bilodeau’s triumph capped a fantastic stretch for Canada on the tricky slope at Rosa Khutor. Canadian sisters Justine and Chloe Dufour-Lapointe took gold and silver in women’s moguls on Saturday. It wasn’t the smoothest night for the favorites, who came to Sochi atop the world rankings, at least until the medal round. The two favorites dominated qualifying, but were hardly sharp in the first elimination runs. Kingsbury slogged to one of the slowest times of the competition while Bilodeau nearly fell on his backside after landing his first jump. Still, it ultimately came down to what is has repeatedly come down to in most of the past four years, the 26-year-old Bilodeau against the 21-year-old Kingsbury in a fight for supremacy. Going fourth in the six-man final, Bilodeau was flawless as he navigated the mounds with his knees appearing magnetized together. He thrilled over the two jumps, spinning and twisting his way through the balmy air before floating back to earth and continuing on his way. Kingsbury couldn’t match it. His knees separated midway through the final run, and while he raised his hands as he crossed the line, he knew he was finished. He pumped his first half-heartedly when his score of 24.71 was posted, more than a full point behind Bilodeau. The two embraced, though it was Bilodeau who flashed the “No. 1” sign during the flower ceremony in the giddy aftermath. It was a predictable finish to a sometimes unpredictable night. Rising temperatures that pushed into the mid-40s during the day turned a course already deemed questionable by some into the world’s largest Slurpee machine. Instead of powdery snow that allows racers to carve graceful turns at near breakneck speeds, nearly half of the field either veered off course or tumbled head over skis during qualifying. And the mistakes weren’t limited to the also-rans. Pat Deneen of the U.S. was hung up midway down the mountain in his first qualifying run and he angrily bulled through one of the gates marking the end of the slope before making his way to the bottom. While he recovered to top the second qualifying run and make it to the finals, defending Olympic silver medalist Dale Begg-Smith of Australia did not. The two-time Olympic medalist — including gold at Turin in 2006 — was attempting to make a comeback after taking three years off following a silver in Vancouver. He was sloppy during the first run before disaster struck in the second. Less than 50 feet from getting through a run clean enough to advance to the medal round, Begg-Smith couldn’t get his skis over in time while completing his second jump. He smashed into the muck, his face a mixture of stunned disbelief and disgust. It marked the first time Begg-Smith missed out on the finals since 2005. But reaching the podium, however, would have been a long shot at best for Begg-Smith following his sabbatical. The sport he once dominated has moved on without him, as Bilodeau and Kingsbury have separated themselves from the rest of the world — a gap that shows no signs of closing.